Availability: use the filters below to check the availabilities in real time (updated every minute). Booking: the boats can be enquired here or by filling out the form on the Booking page. 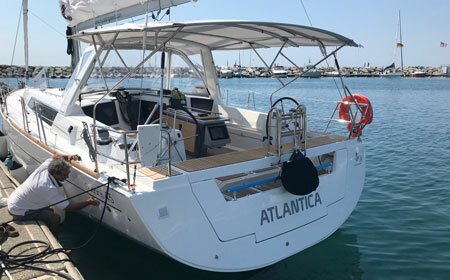 CURIOSITIES AND STATUS PHOTOS OF OCEANIS 45 "ATLANTICA"
Why book Oceanis 45 "Atlantica"
Oceanis 45 Atlantica is a charter sailing yacht, ideal for groups of up to 10 people. The boat is 14 meters long, has 4 double cabins (+ 2 dinette beds) and 2 bathrooms with electrical toilet and shower. You can rent the boat for small holiday getaways, weekend or week charters. The boat is available as bareboat and skippered yacht charter. This sailing yacht is perfect for families: it offers a large interior space, an enormous cockpit and an electrical swim platform, great for children to easily get on and off the boat. 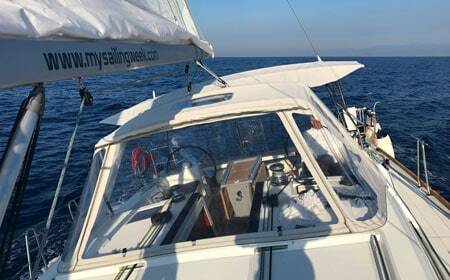 Book this sailing boat for the weekend, explore the Gulf of Poets and admire the enchanting village of Portovenere. Sail around the Palmaria and Tino islands. Enjoy Cinque Terre and Portofino or, if you have more time available, leave for a sailing holiday in Corsica or Sardinia. Find out more about our suggested sailing destinations. 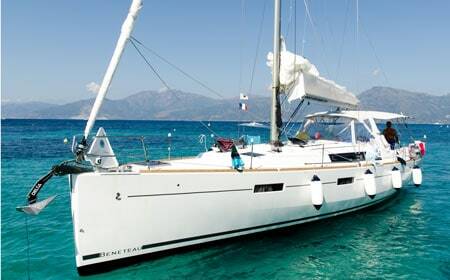 What do our clients say about Oceanis 45 “Atlantica”? The clients that rent this sailing boat love its large external and internal spaces, its 2 electrical toilets and 2 spacious fridges. The yacht stands out also for its sailing performance. The bow thruster allows an easy maneuvering and the high-end electrical equipment on board makes for an exclusive sailing experience.